They have been identified as self-styled finance secretary Avika Achumi (30) of 4th Mile, Diphupar under Dimapur district and Alo Rengma (34) Chunlikha under Tseminyu circle in Kohima district. The Kohima battalion of Assam Rifles and 164 battalion of Territorial Army (Naga) apprehended two NSCN (K) cadre on Saturday. They have been identified as self-styled finance secretary Avika Achumi (30) of 4thMile, Diphupar under Dimapur district and Alo Rengma (34) Chunlikha under Tseminyu circle in Kohima district. Achumi was earlier booked under National Security Act and out on bail since December last year. Based on specific information regarding movement of an NSCN (K) cadre in a Maruti Alto (AS 01 V 1593), the security forces set up a joint mobile vehicle check post at TCP junction in Kohima and apprehended Achumi. Two acknowledgement slips, seven cash receipts, three work permits, one stamp and incriminating documents of NSCN (K) were recovered from him. 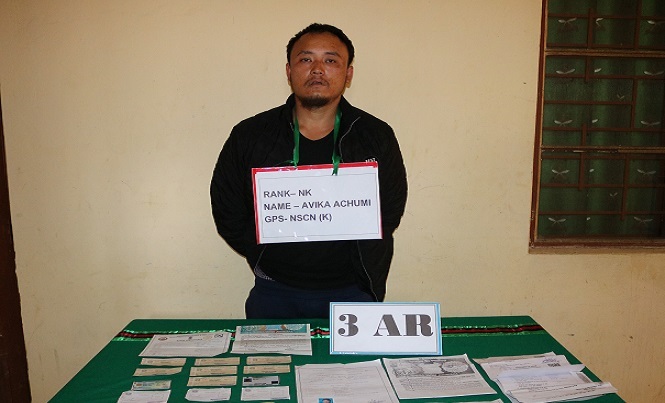 In a follow-up operation, the Kohima battalion of Assam Rifles apprehended Rengma, an accomplice of Achumi. Earlier on June 22, 2017, he was apprehended on charges of extortion and released in February this year. Both the cadres, along with the recovered items, were handed over to Kohima police.